Wolverhampton Wanderers’ fight for promotion continues to be widely covered in Portugal, with all the newspapers reporting the club’s 2-0 over Derby County from last night. There are two special reasons why all the local sports outlets have a story on the game today. First because two Portuguese players scored for Wolves: Diogo Jota and Ruben Neves. And also because the second goal was absolutely stunning. 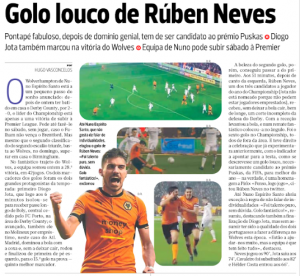 As ‘Neves’ crazy goal’, makes the headline, newspaper A Bola was not afraid to say that ‘it should be a Puskas candidate’. They claim it ‘needs’ to be considered for FIFA’s prize, and take a couple of screenshots trying to explain the shot for readers. All the newspapers also report that Wolves are now closer to Premier League promotion, with the chance to confirm it next weekend. The Portuguese media is very happy for that. And in case Nuno Espírito Santo and his boys stay where they are, we already know Portugal’s favourite club in the Premier League next season.